The holidays are almost here, and you know what that means: chicken fingers!? Available today through Dec 24th, both of NYC's Sticky’s Finger Joint locations -- the city's first gourmet chicken finger restaurant chain -- will be doling out the world's first Hanukkah-inspired chicken finger, the Latka Finger, because honestly, regular latkes just aren't cutting it anymore. This deep-fried holiday beaut is made from antibiotic-, hormone-, and cruelty-free chicken and is marinated in a buttermilk, onion, and applesauce mix. Then they coat it in a batter of grated onions, shredded potato, and matzoh meal and fry it to golden-brown perfection. And to top it off, every finger comes with sour cream and cinnamon applesauce for dipping, PLUS you'll also get a piece of Hanukkah gelt -- a traditional Jewish chocolate coin -- all for $4.95 a pop. And if stuffing your face with festive chicky goodness isn't enough to fill you with holiday spirit, 10% of all proceeds from the sales of the Latka Finger will be donated to MAZON, a national nonprofit organization working to end hunger in the US and Israel. 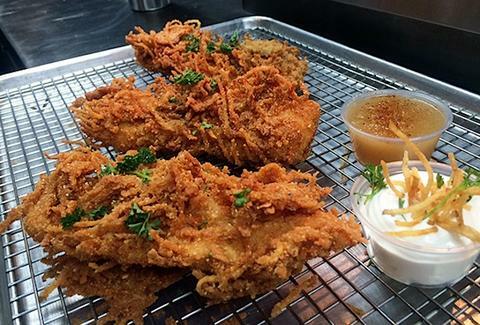 Whether you're Jewish or not, fighting world hunger with Hanukkah fried chicken is a tradition we can all appreciate. Pete Dombrosky is an Editorial Assistant at Thrillist and if you had to be Jewish to eat this chicken, he might just convert. Check out the rest of his holiday musings on Twitter.